We are all moving in the direction of using more cordless tools to get the job done, and more tools means more batteries. Milwaukee has announced a new charger that accepts 6 batteries at once and should make the task of charging a bit easier. When I first saw the Milwaukee Six Pack charger I thought that there was no way it could charge six batteries at one time, and I was right. The Six Pack charger is actually a sequential charger that charges one battery at a time before moving on to the next. Since M18 compact batteries take 30 minutes to charge and XC batteries take 60 to charge, it could take up to 6 hours to charge all the batteries. For this reason, I see the Milwaukee Six Pack Charger as being more useful in a shop environment, where you can throw all the batteries on the charger at night and they will be ready to go the next morning. The charger also features mounting holes and a pass-through cord that also make it suitable for shop use. 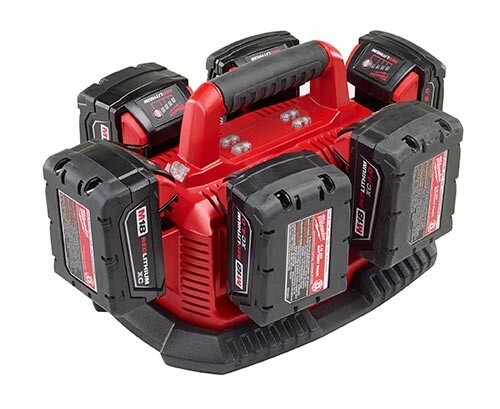 Look for the new 48-59-1806 Six Pack Charger early next year, or you can pre-order now from Ohio Power Tool. The price is not too bad at $99.